Suggested Use: The dose used in the Creighton Study corresponded to 6 tablets per day for a person weighing 147 lbs (67 kg). This dosage can be scaled down for lighter persons, and taken in divided doses, such as 3 tablets 2 times/day. Formula-CS-Plus — a product like this one got a great big “Wow!” from the medical establishment. Formula CS Plus is a nutritional supplement based on the remarkable Creighton Study of 2007. In this study, 1179 healthy volunteers were given daily either a combination of vitamin D3 and calcium, or a placebo. The participants were examined regularly for cancer development and for bone strength. At the end of four years the number of new cancer cases in the placebo group was more than 4 times as high as in the group using the supplement combination — the combination had lowered the cancer rate by 77%. The combination also produced striking improvements in bone strength — participants on the placebo generally experienced a decline or insignificant change in bone mass density (BMD) while those on the supplements experienced an increase of up to 6% in BMD. Shouldn’t a regimen with such great benefits be available to everyone who wants it, without their having to cobble it together from separate supplements? We at LifeLink thought so, and so we decided to create a product that not only provides the Creighton Study regimen but improves on it. We enhanced the formula by adding other supplements that are known to improve bone strength, and incorporated a larger amount of vitamin D3, since the optimum daily amount of D3 is now thought to be higher than that used in the study. Accordingly, we will limit our discussion of Formula CS Plus to a brief summary of relevant research, and let you draw your own conclusions about what medical conditions it may be effective in treating. This product also contains several inactive ingredients: croscarmelose sodium, stearic acid, magnesium stearate, and gelatin. The Creighton Study1 was designed to study the effects on bone strength of vitamin D3 plus calcium, in higher doses than are traditionally used — 1100 i.u. of D3 plus 1400 mg of calcium. (This is why the recommended daily dose of Formula CS Plus is six tablets — the calcium wouldn’t fit into a smaller number of tablets.) The Creighton researchers also decided to look for anti-cancer effects in the study regimen, since previous studies had already shown that vitamin D3 has such effects even at lower doses. It must have come as a big surprise, however, when the anti-cancer benefits turned out to be so large. 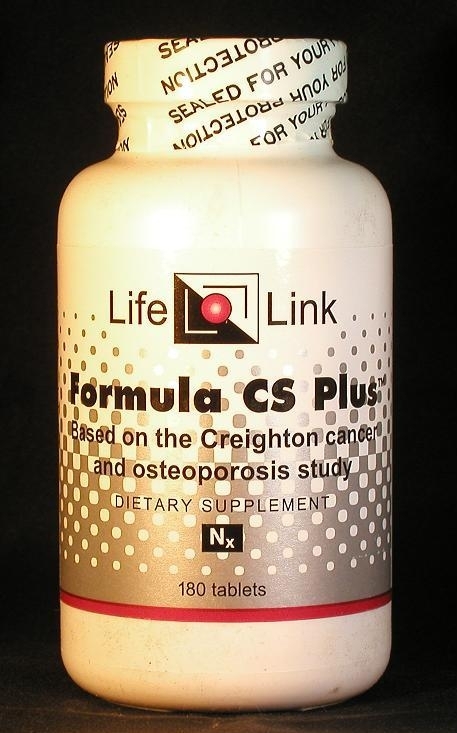 Therefore, LifeLink’s Formula CS Plus enhances the regimen of the Creighton Study by adding vitamin K, zinc, boron, silicon, and an additional 260% of vitamin D3. Cancer. Numerous clinical, laboratory, and epidemiological studies have recently brought this vitamin to the fore as a cancer treatment and preventative.4,5,6,7,8,9 Research during the past several years has shown that vitamin D can inhibit proliferation of a wide variety of cell types.9 According to one reviewer, this “antiproliferative action makes [vitamin D] a possible therapeutic tool to treat … different types of cancer.”6 For example, a 2006 review of vitamin D treatment of prostate cancer reported that the vitamin “showed significant antineoplastic activity in pre-clinical models of prostate cancer and many other tumor types.”10 A recent compilation of statistics from clinical trials revealed that “an impaired vitamin D status is associated with a 20-30% increased breast cancer incidence and 10-20% increased mortality.”7 The clinical data that supports these conclusions was collected from studies that used relatively low doses of vitamin D — typically less than 1000 i.u. per day. Now the Creighton Study has shown that 1100 i.u. per day produces far better results than the piddling amounts recommended by officialdom. Osteoporosis. Vitamin D’s history of use as a bone strengthener goes back at least to the 1920s, although people have used it unwittingly since ancient times, inasmuch as they learned to avoid getting vitamin D deficiency diseases by eating certain foods or by spending time in the sun — fish, eggs, butter, beef are dietary sources of this vitamin, and sunlight stimulates its production in the skin. There are many vitamin D deficiency diseases, the most famous of which are rickets and osteoporosis. The optimum amount of vitamin D3 consumption undoubtedly differs from person to person, and certainly depends also upon what condition one hopes to alter — for example, the best dosage for cancer prevention may not be the same as that for bone strength. In any case, the optimum amount is not really known for any condition. We do know, however, that 1100 i.u. per day is better than 400 i.u., and that experts are leaning toward considerably higher doses than 1100 i.u. One prominent researcher suggests 10,000 i.u./day.3 Some supplement companies are offering vitamin D3 products containing as much as 50,000 i.u. per capsule. LifeLink settled on 4000 i.u. for Formula CS Plus in order to enhance the formula without going too far beyond the parameters shown to be effective in the Creighton Study. It has long been known that calcium consumption is required for bone strength since it is a major constituent of bone. The body continually removes and replaces the calcium in bone in a process called ‘remodeling’. Though this may seem like an inefficient way to maintain bone strength, it is an effective method for repairing bones micro-damaged by ordinary stresses and it also enables the skeleton to grow during childhood. The calcium removed from bones in the remodeling process is used in other ways in the body, but eventually gets excreted and must be replaced by calcium from the diet. The amount required to barely replace the calcium lost to excretion in the average adult is about 740 mg per day.13 This is a consumption level that is adequate to prevent a rapid loss of bone calcium due to deficiency, but not enough to prevent osteoporosis. So… what is the optimum level of calcium intake for those who want to prevent osteoporosis and for those who are taking larger-than-average amounts of vitamin D to improve their bones instead of just letting them slowly deteriorate? Prior to 1994 it was thought that a few hundred milligrams of calcium per day would be the right amount for the average person. Then it was decided that 1000 to 1200 mg would be better.14 And the amount recommended by clinicians keeps rising. The Creighton Study points to 1400 mg/day — an amount that can provide a 6% increase in bone mass density in four years if accompanied by an appropriate vitamin D supplement. This is the amount chosen for LifeLink’s Formula CS Plus — 1400 mg of calcium (i.e., 6600 mg of dicalcium tricitrate) divided into six tablets taken daily. In addition to its structural role in bones, calcium serves countless other functions in the body. One of them is in signalling between cells, and in triggering the self-destruction of cells that have become damaged — for example, cells that have become cancerous.15 The subject is extremely complex and far from being well understood. Therefore, if we want an answer to the question “How much calcium should I consume in order to minimize my risk of getting cancer?” we must look to dietary experiments rather than to cell signalling research. The Creighton Study suggests one answer: people’s cancer risk was reduced by 77% when 1400 mg/day of calcium was consumed. Whether this the optimum amount for cancer prevention, we don’t know. Nevertheless, it’s not a bad answer. Zinc counteracts an aging effect seen in mutant mice — an effect apparently due to altered phosphate regulation.19,20 Since vitamin D can influence the body’s phosphate metabolism, and some humans have biochemical defects similar to those of the mutant mice, zinc orotate was added to the formula as an anti-aging ingredient. Formula CS Plus provides 15 mg/day of zinc in the form of zinc orotate. A good overview of zinc’s activities in the body is the one by the Linus Pauling Institute.23 The zinc dosages suggested there are merely the amounts needed to avoid common deficiency diseases, not the optimum amounts for preventing disesases like cancer and osteoporosis. The term ‘vitamin K’ refers to a collection of similar, but not identical, substances, the most well-studied of which are Vitamin K1 (phylloquinone) and Vitamin K2 (menaquinone). Menaquinone itself is a group of related substances referred to as ‘MK-1’, ‘MK-2’, … etc. Menaquinone MK-7 appears to be the best form of vitamin K to use as a supplement because its long dwell-time in the body gives enables it to reach stable and effective concentrations.28 Formula CS Plus provides users with 100 mcg of vitamin K2 MK-7 daily. Formula CS Plus provides users with 10 mg/day of boron. The optimum daily amount of silicon is not known. The average silicon intake from food is about 30 mg/day, but it varies widely depending on diet.35 Formula CS Plus includes another 30 mg/day, thereby ensuring that users of this supplement will have at least an average silicon intake — even if their diet contains none at all. The supplement is best taken in divided doses at least an hour apart because the calcium is absorbed better in smaller amounts. Three tablets taken twice a day at mealtime would be a reasonable regimen; two tablets three times a day would be even better. No serious side effects were observed during the Creighton Study.1 A feeling of lethargy could be an sign of hypercalcemia — too much calcium in the blood — an indication that the supplement may be working too well at making calcium bioavailable. In that case one should try reducing the dosage. Is Formula CS Plus useful for the conditions and purposes mentioned above? We aren’t allowed to tell you, so you should take a look at some of the references cited here, and then decide for yourself.